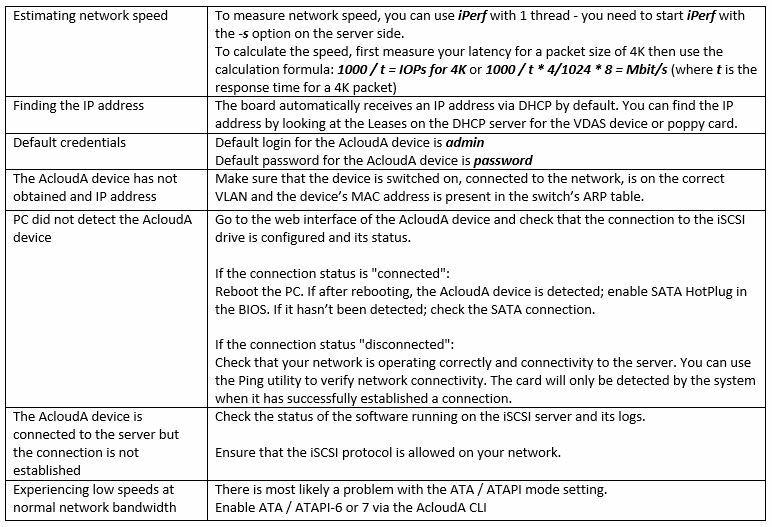 This document presents the basic information on installing and initial configuration of AcloudA VDAS (rev 1.0). It is a comprehensive step-by-step guide, designed for users who are new to AcloudA product and technologies. For any technical inquiries please contact us. The device is a hardware iSCSI initiator. Until you install the iSCSI session, the device will not be displayed on the system. 4. To reset the IQN to the factory settings you must completely reset the settings in the “Reset” tab. The best performance was achieved with MTU 4400. It is recommended that you allow jumbo frame packets on the network. If the write speed to the device does not exceed 1Mb / sec, while the bandwidth of the channel is much wider than 10Mbit / sec, the device most likely works without UltraDMA support. To reset the settings, install two jumpers on the board (located near the network connector) and turn on the device. The existing configuration file will be erased. AcloudA Management Util V1.0 – utility for switching modes UltraDMA. mode of operation, if this does not happen, it is recommended to perform the switching yourself. The board operates with 1 stream; therefore, the speed is directly proportional to the latency. We do not guarantee correct operation for channel widths to the server lower than 3 Mbit/s with delays greater than 65ms, as errors can occur when working with the file system and the ATA driver. Some system administrators can partially or completely block certain packets including ICMP, UDP, TCP and ping. Different file systems can have different timeout parameters for blocks. Different implementations of iSCSI servers can have different boundary settings for response time and session creation. The bandwidth of a channel can dynamically change due to the rebuilding of the routing tables of the network. You can check the route changes using the traceroute or MTR console utilities on Linux, and tracert on Windows.